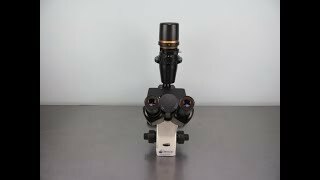 The Fisher Scientific Inverted Microscope provides you with comfortable viewing and simple use. This inverted compound microscope has an adjustable binocular head to suit the viewers face, and is set at an ergonomic 45° angle. This lab microscope also has a low-profile stage that allows for easy swapping of slides, and focus adjustments set toward the front of the instrument. This inverted microscope comes with 4x, 10x, 25x Objectives, and a condenser with a green filter to give Achromat and Plan Achromat microscope objectives the best performance. This Fisher Scientific 12-560-45 Inverted Microscope has been fully inspected and the optics are clear. All of our lab equipment comes backed with our standard warranty. Should you have any questions, please don't hesitat to contact us.